Today we went to the Dolma Ling Nunnery to interview Rinchen Khando, the founding director of the Tibetan Nuns Project. 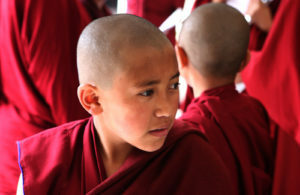 The Tibetan Nuns Project was created to promote the education of the Buddhist nuns, as well as provide them with a home and community in which to study. Rinchen Khando’s work has been the driving force in creating the nunnery and I was excited to be able to interview her. Upon entering the nunnery, we truly stepped into a different world. I was taken aback by the immense beauty of the gardens and the buildings, decorated with prayer flags, set against the magnificence of the snow-capped Himalayas. While touring the facility, we saw a whole new way of living. There are 240 nuns who live communally in the nunnery. The nuns all have different jobs, from cooking, to cleaning, to sewing, and work very hard to be completely self-sufficient. I loved walking through the retreat garden, where the nuns live in solitude for months at a time to better understand their consciousness. After the tour, we walked through hallways covered in flower pots to our room set up for the interview. When Rinchen Khando entered the room, I was immediately calmed. She had the friendliest smile and spoke meticulously and thoughtfully. I was struck by her newest initiative, the creation of a center for laywomen to study Buddhist principles. She said that while the focus of the Tibetan Nuns Project has been to give the nuns opportunities to study Buddhism, it is imperative that all women learn the values that can positively shape future generations. I think it especially important in today’s climate that the principles Rinchen Khando seeks to promote—compassion, sincerity, and altruism—are integrated into everyday life. Through this process, we will be able to create real positive change. Today we interviewed Rinchen Khando. She walked into the room and I swear she brought with her such a lightness and positivity. We all knew she was special. Kindness and joy radiated off her as she answered our questions, along with intelligence she possessed. I was inspired by the work she has done, and is still doing, to help the nuns from Tibet. The facility that we saw was inspiring and intricate; you could easily tell how much time and hard work went into it. Stone pathways weaved in between buildings, beautiful trees, and meadows. Each building contained different classrooms and work rooms. Nuns were hard at work in these rooms, sewing, cooking, and studying. Yet in this hard work they were still filled with joy and gratitude. It appeared as though they had truly found inner peace. Our interview with Rinchen Khando has been my favorite interview to date because of the nature of her character and the advice she gave us. She shared many new concepts that really made me step back and think. For example, she said that we alone can remove our personal obstacles. That really resonated with me because I feel like I have internal struggles and I tend to look outward for help to fix them. Although I know I can always, and should always, reach out for support, I cannot rely on others to fix my problems, or in her words, remove my obstacles. This really opened my eyes and I hope to carry this with me. Everything about India has been inspiring. Inspiring due to the beauty in the people I have met, and inspiring due to the destruction and poverty I have seen. One moment we meet wonderful people like Rinchen Khando and the next moment I see a woman begging for milk for her baby. Next, I am at a beautiful mosque, then I see starving and filthy dogs laying on the streets. Overall, this has been an amazing experience and I feel lucky to have this opportunity. However, the learning experience is also impacted by the hardships we have seen. Today, while walking through the magnificent courtyard of the Dolma Ling Nunnery, I was beginning to understand a bit about the stunning work that Rinchen Khando was doing. Our excitement for this interview had been building up quite a bit at this point. 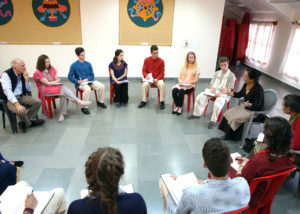 We had just finished preparing and practicing how we would recite our questions. We had no idea what to expect but we knew that she was one of the smartest, most inspiring, organized people we would ever meet (according to what our teacher Ward had told us). I was starting to put the pieces together once we arrived at the nunnery. The view of the snow capped mountains was remarkable and the place had a special peaceful ambience to it. Walking through the hallway, I was immediately surprised by a group of 4 ten year old nuns who burst past Anika and me. They were laughing and smiling, and radiating a joyful aura that made both of us smile. This place was special. 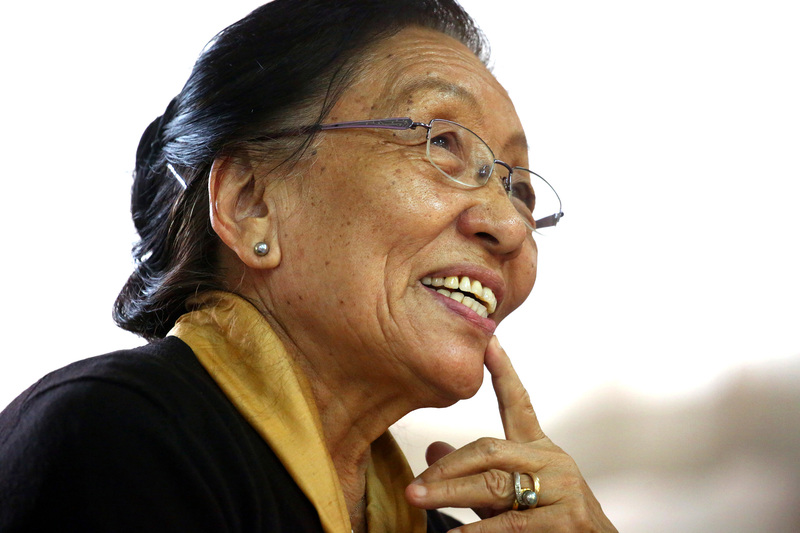 I knew that providing a place for the nuns to study, play, create art, and live a self sufficient life was near and dear to Rinchen Khando well before she even explained this to us. This incredible opportunity the nuns have to lead a simple, hardworking life, was strictly the product of Rinchen Khando’s great effort and powerful vision. Before the interview even started, we knew we were in for something special. I knew I would interact with a woman who had put her feet to the floor and built something amazing. Once we were in the room with her all of us were immediately connected to the knowledge she was sharing with us, and her sweet charismatic charm allowed for a seriously intimate and deeply conversation. She shared with us lessons related to sincerity and awareness, within the context of building a strong foundation for how we can most efficiently dedicate ourselves to providing our service to the greater community. Rinchen Khando shared with us how Buddhist values and principles can help us better understand ourselves and the role we play within our global community. She stressed the importance of deep critical thinking and analysis of our own individual lives and choices. We talked about how reflection plays a very important role in understanding how we must grow as human beings to be the absolute best we can be. I loved these ideas because during this time in my life, I am feeling as if there are so many things that are rapidly changing. Understanding how slowing my mind and thoughts down can benefit me as I make major choices in my life, gives me the strength and confidence I need to make careful decisions about how I choose to live my life. Her ideas opened my mind and heart to accept the idea that riches might not always come in the form of material wealth or fame. Instead, she provided an example of how selfless action and dedication can lead to a sincere happiness residing deep within the heart. Sitting in the circle she was able to share this invaluable information with us. She was able to honestly and openly pass forward awe inspiring knowledge, that transcended the barriers of culture and wealth. The fact that she was able to gift us such kind words and advice in such a beautiful institution, that she had helped to create, made the experience truly magical. Today she opened up her heart to us and helped us reflect deeply on what our individual responsibilities are, and how we can make the best use of the resources we have in order to make the world a better place. 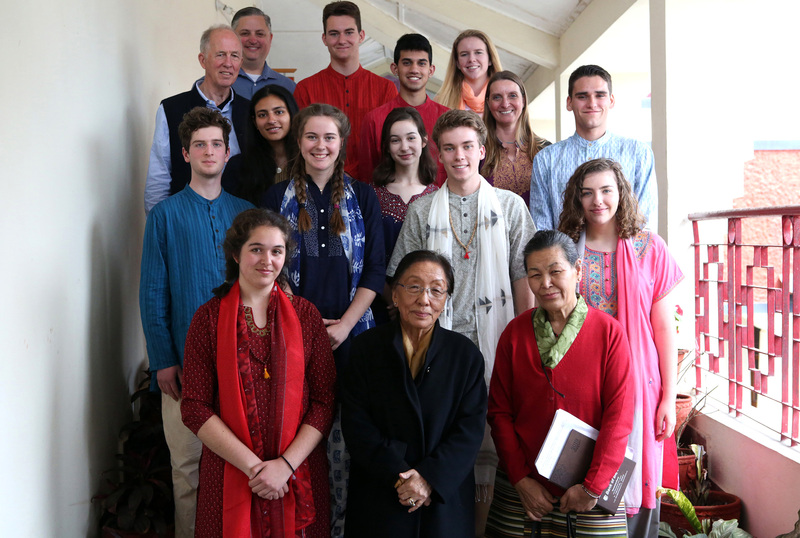 Today, after our interview with Rinchen Khando, we had the privilege of taking a tour of Norbulingka. Norbulingka is an institution founded after the Tibetans were exiled to preserve their culture. When we walked through the opening gate, it was like we were transported into a different world; there was an abundance of greenery and a feast of vibrant colors, contrasting with the littered, crowded streets we are becoming accustomed to. Each aspect of the area clearly showed the careful attention dedicated to it. Even what is considered ugly was turned into something beautiful; a nasty gutter was transformed into a series of majestic dragon heads in colorful designs. 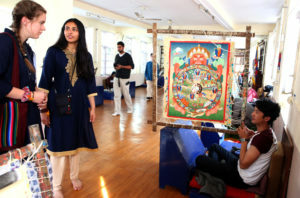 There were specific rooms dedicated to the unique art forms of Tibetan culture, including: paintings, sculptures made of various metals, and detailed fabric stitched tapestries, to name a few. My favorite part was being able to watch the artists in each room create their masterpieces in their natural areas. I was completely fascinated by a particular painting style called thangka, which depicts a Buddhist deity, scene, or mandala painted on cotton or silk. I was struck by the tiny details and use of color and negative space, and especially the use of gold to highlight certain aspects of the painting. The moment I saw the artists’ delicate paint brushes, natural paints being made with a mortar and pestle, tightly wound isles holding the fabric in place, all organized into a little personal station, I knew I wanted to try it myself. I could have spent hours examining one art piece, while appreciating all the time invested in making it the brilliant piece it is. It is amazing how much patience and talent goes into each individual stroke of the brush. I fell in love with the details and beauty these artists created, and it is amazing how the Tibetans have preserved their culture in such a beautiful way.